Today I will bake...and I want you to come over and share the (hopefully!) yummy results. I called my daughter who is studying away from home, that I am thinking of baking birthday cake for her daddy. She got excited as it was surprise for her to hear this and started few rapid fire questions, I told her when you come home, see it with your eyes and asked her that daddy will come to fetch you, keep him busy for few hours so I can finish some loose ends for his surprise b' day, and hurriedly hanged up the phone and rushed in the kitchen to bake a cake ! Next day on his birthday, candle lit cake makes an appearance on the dining table, he was gobsmacked. "Mum baked it yesterday, while you came to pick me up" daughter narrated whole story to him. Before he praises me, I got told off by him that I shouldn't have taken that risk with my ill health and with lots of if's and but's and few disagreements later we all cut the cake together, of course appreciation and gratitude was shown by hubs and kids with every bite of cake ! Toasted Coconut cake with Coconut Buttercream, that just knocked our socks off. That was pure decadence on a plate and took our taste buds to next level. We found every layer unique in flavour and deliciously rich. Moist yet fluffy cake slices were just melting in our mouth and surely melting our hearts. One 8" three layered cake was vanished by the next morning, kids and hubs made me swear that I would make this again ! Baking the three layered coconut cake, surely it was baking adventure for me. Baking with coconut flakes and coconut milk and top of that to bake an eggless cake, huge task for me. Without any doubt, this cake was worth every second I spent in kitchen that day, juggled every seconds and stress I took with time pressure, the pain I endured to fetch those jars and packets from the cupboard over my head. This cake was worth million times, the smile and appreciation I saw on faces of loved ones and to capture those precious moments. This layer cake is just delicious as it's decorative and definitely this is the perfect dessert for a perfect and special occasion ! This layer cake is just delicious as it's decorative and definitely this is the perfect dessert for a perfect and special occasion ! Pre heat the oven to gas mark 4.Grease three 8" cake tins with oil or butter and lined with parchment paper.In a bowl mix the flour, salt, sugar, baking powder and baking soda.In a bowl of food processor or standing mixture with a paddle attachment or flexible beater mix oil, vanilla, vinegar, buttermilk and coconut milk on medium speed till all combined.Reduce the speed and add cake flour mixture and mix until just incorporated.Now gently fold in the coconut flakes.Evenly divide the cake mixture into three greased pan and spread evenly.Bake for 20-22 minutes or until wooden pick inserted in cake comes out clean.Cool the cake tins on a wire rack for 10 minutes before inverting on rack. Let it cool completely. Beat butter for 3-4 minutes on a medium speed.Add icing sugar and turn the mixer on a low speed, beat until sugar incorporates well with butter. Add coconut milk and vanilla, beat the mixture for 3 minutes on medium speed or until you see light and fluffy buttercream. 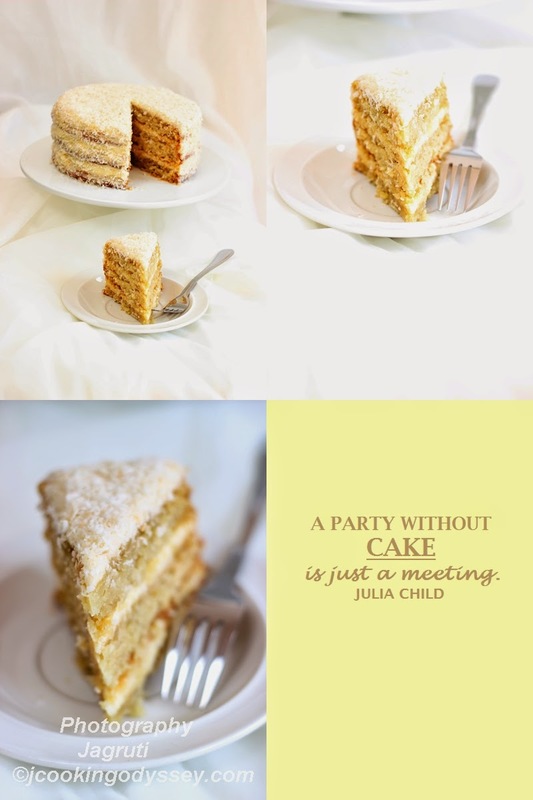 Assemble the cake.Spread one tablespoon of frosting on a serving plate or cake stand.Place one cake layer on top of spread buttercream, and spread 1/3 cup frosting.Now place second cake layer on top and gently pressed down.Spread with another 1/3 cup of frosting.Place third cake layer on top and gently pressed down.Smear the not too thick layer of frosting on top and sides of the whole cake.Cover the cake with toasted coconut flakes.Cover the cake and keep in the refrigerate. Bring it out in the room temperature at least one hour prior to serving. Enjoy ! 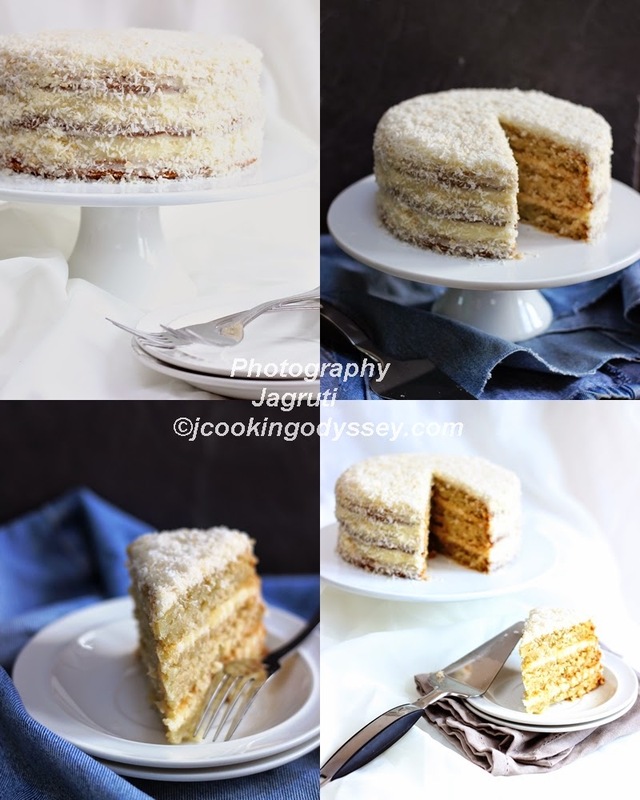 I have a weakness for coconut flavoured cakes and i cant take my eyes from your gorgeous toasted coconut layered cake and those layers are just prefect. Seriously what a pretty cake Jags, just speechless. The coconut flavored cake looks so inviting ! Beautifully presented and awesome photography ! This cake looks awesome, perfectly made. Loved it to the core Jagruti. I don't like coconut much and this is tempting me to try and such superb clicks.. I love anything with coconut and cake is just so perfect. Coconut in the cake and on top too, yummy. I'm sure the whole family must have enjoyed, making your efforts worthwhile in spite of the frozen shoulder. Awesome delicious cake , loved it :) I love coconut so so much would love to try out the recipe soon. What a beautiful cake! Loved your presentation and pictures. Last year I tasted coconut cake in vegan farewell. After that i forgot about that. Thanks for reminding a delicious cake. This coconut cake looking delicious. I do love basic cake, but with cream its gonna add another layer of deliciousness. I loved reading the post and so many pictures to keep me drooling till the end. Hats off to you. Any advice on a vegan version? I can substitute butter for a vegan type but not sure the best buttermilk substitution. Thank you Unknown for visiting our blog. Replace the buttermilk with Vegan yogurt (Add little water to vegan yogurt and mix ).